It’s the time of year when many people are planning trips to Europe. Below is an article my wife wrote about Florence, Italy several years ago but the information is still relevant today. And by the way, if you are planning a trip to Italy, I’m jealous! You’re going to have a great time. Florence, Italy, at the heart Tuscany and the birthplace of the Renaissance movement, is a feast for the senses. There is so much to see and do that it can be seem overwhelming. I have listed below what I consider to be the “must sees” for Florence, along with some tips for making your visit to these locales even more enjoyable. At the bottom of the article I have listed two attractions that I didn’t discover until my third visit to Florence and I consider them well worth the effort. Before I start with the sites, I’d first like to recommend that you read The Agony and the Ecstasy: A Biographical Novel of Michelangelo by Irving Stone before your trip. I couldn’t put this book down and it gave me a greater appreciation of the art and architecture of Florence (and Rome for that matter) as well as the artistic genius of the man behind the story. Florence is relatively compact and you will be able to access all of the main tourist attractions on foot. The bus system in Florence is also easy to navigate. But if you arrive in Florence via car, I highly recommend that you park the car outside the city and walk (you’ll be fined if you drive in the historic core of the city and parking nearby is nearly impossible anyway). We parked our car at Piazzale Michelangelo because it’s free, has a great view of the city, and is within easy walking distance of the main part of town. Do remember to save some energy for the walk back to the car though because it is uphill! 1. Accademia (Galleria dell’Accademia): No trip to Florence is complete until you have seen Michelangelo’s David. The statue will take your breath away, not only because of its sheer size, but also because of its incredible beauty. Tips: As you make your way to the main, domed gallery to view the David, take your time to explore the other Michelangelo sculptures, some of which are only partially complete, including Prisoners, St. Matthew and a Pietà. They will give you a true appreciation of Michelangelo’s talent as a sculpture. If you will be visiting Florence during peak tourist season, you will definitely want to purchase your tickets to the Accademia in advance. 2. The Duomo (Santa Maria del Fiore), The Baptistery and Giotto’s Tower: If you spend any time at all in Florence, you can’t help stumbling upon The Duomo, Baptistery and Giotto’s Tower. The exteriors of these buildings are covered in green, pink and white marble and the detail is astonishing! Make sure to observe Ghiberti’s famous bronze doors on the Baptistery, referred to as “The Gates of Paradise”, but note that these are not the original doors – the originals reside in the Duomo Museum (more on that later). Tips: Enjoy the outside of The Duomo because in my opinion, the inside of the cathedral isn’t much to get excited about. The real splendor of The Duomo lies in its dome. 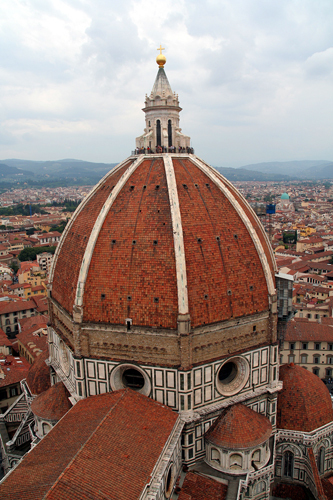 The dome, built by Brunelleschi during the Renaissance, was a groundbreaking engineering phenomenon. And here, another book recommendation: Brunelleschi’s Dome: How a Renaissance Genius Reinvented Architecture by Ross King, will give you a true appreciation of this amazing dome and the book is amazingly readable so give it a go. Many tourists wait hours in line to climb the Duomo’s Dome. While a climb up the Duomo’s Dome is well worth the hike, if you are short on time, Giotto’s Tower next door is a great alternative – you can view the exterior of the Duomo dome from the top and will have the same spectacular views of Florence that you would have from the Duomo dome. 3. Medici Chapels: If you are a fan of Michelangelo, you can’t miss the Medici Chapels. The Medici Chapels contain the tombs of many members the Medici Family, Florence’s ruling family and patrons of the arts. One entire room within the Chapels was designed by Michelangelo and contains his sculptures Dusk and Dawn and Night and Day. Tip: The Medici Chapels are relatively small and can be visited within a reasonably short amount of time so you may have time to wander through the San Lorenzo Market just outside or the nearby Central Market – you’ve got to try haggling with the vendors because it can be a lot of fun. 4. Santa Croce Church: The primary reason that I recommend visiting the Santa Croce Church is because you will be awestruck by the many impressive historical figures buried or memorialized there – Dante, Galileo, Machiavelli, and Michelangelo. It’s a humbling experience. 5. Ponte Vecchio: Ponte Vecchio is Florence’s famous bridge across the Arno River and is lined on both sides by stunning shops selling gold, all of the 18K variety! Tip: It’s a feast for the eyes but spending too much time on the Ponte Vecchio could be bad for the pocketbook. I recommend making this stroll a window-shopping experience. If you really are in the market for gold jewelry, you will probably find more reasonable prices at other shops around town. 6. Uffizi Gallery: The Uffizi Gallery probably contains the greatest collection of Italian paintings found anywhere in the world so art lovers won’t want to miss it. Tips: While the art is impressive, the sheer size of the Uffizi Gallery is overwhelming. I’d recommend trying to arrange a tour so that you don’t miss the highlights while trying to find your way through the many galleries. So here are the two attractions that I didn’t discover until my latest visit to Florence. They seem to be less well-known than the other attractions but I highly recommend making time to visit them. 7. Duomo Museum (Museo dell’Opera del Duomo): The Duomo Museum has long been under appreciated but turned out to be one of my favorites. One reason it was so enjoyable is that the hoards of tourists weren’t there so we could take our time to enjoy the art. Tips: Make sure you see Michelangelo’s Pietà. 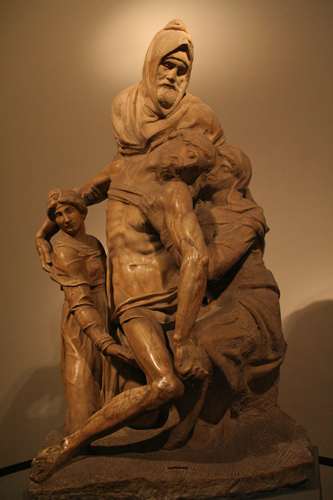 This was one of his last, if not his final, sculptures and was intended to be for his tomb (many also believe that the face of Nicodemus is that of the artist). Several of Donatello’s sculptures can be viewed in this museum as well, including the haunting Mary Magdalene. Additionally, the original, restored bronze panels from the Baptistery (the Gates of Paradise) are on display here. And finally, there is a large display dedicated to the construction of Brunelleschi’s Dome, including a detailed model of the dome within a dome and the tools used in the construction. You can also glimpse Brunelleschi’s death mask nearby. 8. Science Museum (Istituto e Museo di Storia della Scienza): Many don’t realize that science prospered in Florence alongside the art and architecture and that Florence can lay claim to many scientific breakthroughs. Tip: Anyone with even an iota of interest in science and/or astrology must visit the Science Museum. The museum is chock full of gadgets and gizmos and most interesting of all, Galileo’s finger in a jar! It’s a nice change of pace from all of the churches and art museums that you’ve no doubt spent hours exploring already. Finally, while you’re making your way from site to site in Florence, take some time out to relax at a sidewalk café with a cappuccino or an exquisite meal and don’t forget to enjoy the colorful and always delicious gelaterias that line the side streets. 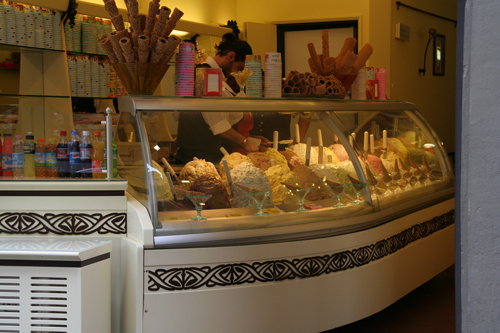 There’s nothing more refreshing that a delectable cup of gelato! Ciao bella! This entry was posted in International Travel, Travel Inspiration, Travel Tips and tagged Duomo Museum, Florence, Italy, Medici Chapels, Michelangelo, must sees, Ponte Vecchio, Santa Croce, Science Museum, The Duomo, The Uffizi Gallery, tips, travel. Bookmark the permalink.